Prototype: German State Railroad (DRB) class 50 freight train locomotive. Version with a box-style tender and Wagner smoke deflectors. Use: Heavy freight trains. 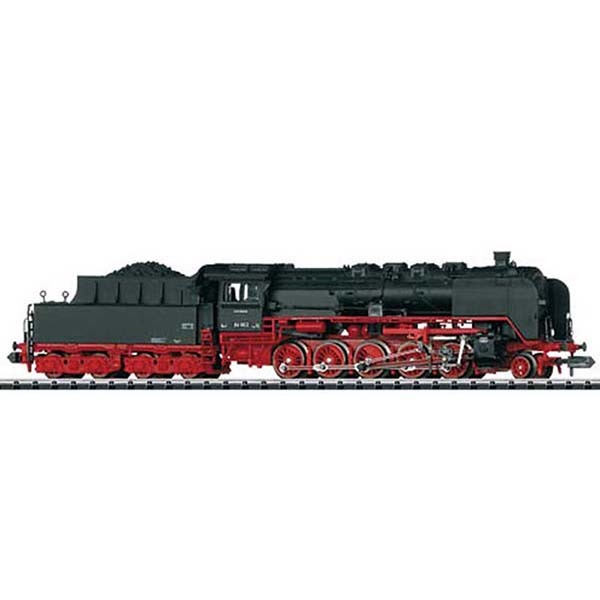 Model: The locomotive and the tender are constructed of die-cast metal. The locomotive has a powerful can motor with a bell-shaped armature and a flywheel. The motor and the gear drive are built into the boiler. The locomotive has a DCC digital decoder with extensive sound functions. There is a close coupling between the locomotive and tender, and there is a close coupler mechanism on the rear of the tender. 5 axles powered through side rods. Traction tires. Length over the buffers 144 mm / 5-11/16.